This morning on Meet The Press, Governor Chris Christie (R-NJ) predicted a “restart” of the 2012 presidential election following the first debate (this coming Wednesday evening). The governor says people are just now starting to tune-in to the campaigns, and in the debate they will see GOP presidential nominee Mitt Romney lay out his vision. “And that is when you will really start to see this race tightened and then move in Governor Romney’s direction,” he said. Gov. Christie said twice that President Barack Obama is giving the country “happy talk,” but voters will not “anesthetized” by this. A few technical notes: Host David Gregory played a new Obama campaign commercial for Gov. Christie (appearing remotely from New York), and then asked for comment. 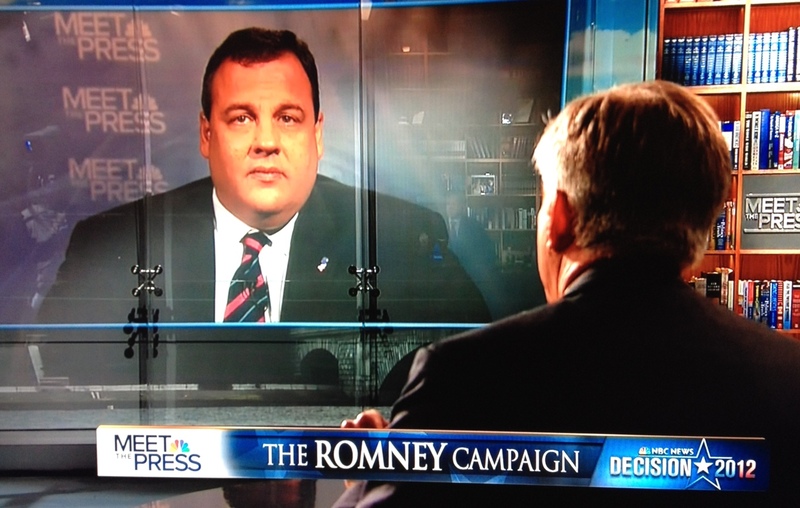 Christie could not see the commercial. Later it appeared that there was loud talking or other behavior in the New York studio distracting Gov. Christie. Mistakes like these are not acceptable for a big-time, television network. When the next guest, White House Adviser David Plouffe appeared, it again occurred to me that these sequential interviews are fundamentally awkward. Having Christie and Plouffe appear for a simultaneous interview could have been electric. And a few electric moments are what Meet the Press needs to re-establish its historic lead in the Sunday morning ratings. “Challengers tend to benefit from debates,” said Plouffe who added that, as Gov. Christie just showed, the Romney campaign has set the expectations for these debates quite high. Plouffe admitted that this election will be tighter than 2008, but he reminded that early voting has already begun in key states. Gregory spent a good chunk of time looking at the facts and changing stories around the September 11, 2012 attacks on a US consulate in Libya which killed four Americans including the US ambassador. He said the explanations have changed. Plouffe basically agreed saying as more information became available, our understanding of what happened changed. Gregory suggested that there were political reasons why the White House was reluctant to blame this attack on Al Qaeda. Plouffe said that was “preposterous.” Plouffe also dismissed calls for US Ambassador to the UN Susan Rice to resign. And he rejected the idea that President Obama is focused more on campaigning than on being president. On President Obama’s use of the term “economic patriotism,” Plouffe said this refers to creating more products stamped “Made in the USA” which can be sold around the world. In the roundtable, NBC’s Chuck Todd ran through the polling numbers in the battleground states, each of them showing sizable advantages for President Obama at the moment. Ralph Reed of the Faith and Freedom Coalition said, “History shows challengers close late.” He added, “There will be a lot of surprises” on election day. The BBC’s Katty Kay said it feels like Gov. Romney is trying to win each news cycle rather than win the election. Reed discussed President Obama’s “casual relationship with the truth,” and said Gov. Romney will call him out on several things. When it comes to debate strategy, Todd predicts President Obama will be aggressive and try to get under Mitt Romney’s skin rather than adopt an “above the fray” kind of attitude.